Updates | DUSTECH in Ambala,The Company was promoted in 1995 by a consortium of self employed engineers and commercial graduate having professional aptitude, years of experience in Design, Manufacture, Supply, Erection and Commissioning of Industrial Air Handling Equipments and Systems. Our Founder member Mr. R.K. Gupta has worked with reputed companies and has more than 35 years experience of Industrial Ventilation for Private Industries, Power Houses including coal handling Ventilation for different locations, tunnel ventilation, Cement Industries. Dustech is committed in Quality, Service and satisfied customers in providing a better environment in industries. In India, the clean environment awareness is gaining more attention now only and the business potential for providing environmental systems is very high. The scope of Air Handling equipments and systems in the Indian Industry was tremendous as healthy atmosphere in Industry proved to be very useful for better productivity, health of workers and life of machines. We have numbers of satisfied customers by our optimum design and competitive pricing and are giving us repeated orders for this field wherever they required. Quality is the most essential aspect of our product. To maintain consistent quality we have taken ISO :9001 certification in the year 2000. 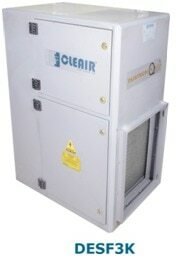 The Company in beginning supplied Ventilation equipment to high reputed companies those needed quality materials, perfect system and good performance. Dustech followed the same path and proudly to deliver best system and equipment at very competitive rates. The aim of our company is to serve the industry in most economical way by providing better engineering services and to increase the list with satisfied customers. “DUSTECH” Air Conditioning Grills manufactured and exported by us are known for their functional efficiency and easy operations. Easy to install, these products are highly suitable for sidewall and ceiling applications. For fabrication of these products, we bring into application galvanized or mild iron sheets as well as extruded sections of aluminium. “DUSTECH” centrifugal fan is a mechanical device for moving air or other gases. The terms "blower" and "squirrel cage fan", (because it looks like a hamster wheel), are frequently used as synonyms. These fans increase the speed and volume of an air stream with the rotating impellers. Centrifugal Backward Curved Fans/Blowers consist of Double Inlet Double Width (DIDW) and Single Inlet and Single Width (SISW) configuration. These fans have backward curved impellers with backward curved blades having special profile to give you maximum efficiency at low noise levels. Evaporative coolers, often called swamp coolers, the supply airstream is in direct contact with water by means of an evaporative medium or wetted pad (such as fiberglass, fabricated paper, or aspen pad) or a series of spary misters. The supply air steam gains a lot of moisture in this process so cool, moist air must be exhausted from the cooled space and not reused or reconditioned.